Consider a common L.A. scene: A group of teenagers going to or from school is hanging around a bus shelter, waiting to catch the next MTA bus. The shelter is one of those new “street furniture” models with advertisements, and this one happens to display a large ad for a brand of beer. Despite studies by public health organizations that have shown a connection between outdoor alcohol advertising and alcohol abuse, particularly by underage youth, the only reference to such advertising in the city’s street furniture contract is an appended letter from CBS/Decaux that says, “We will limit alcohol advertising to furniture locations that are in non-sensitive areas and that follow the City’s zoning laws.” What constitutes a non-sensitive area is left to the imagination. In fact, no other metropolitan area in California allows this advertising on their public transit, although a survey by the Marin Institute showed violations of the prohibition in San Francisco. 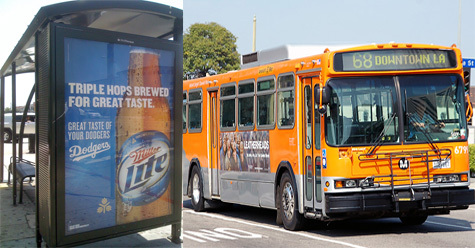 Some public health groups have been particularly concerned about alcohol ads on public transit, because it is heavily used by teenagers and others believed to be most susceptible to the messages. 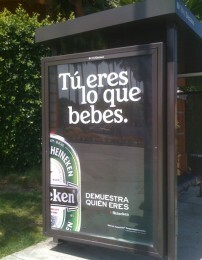 In Boston, for example, such ads are allowed, and have been the subject of recent protests by persons concerned about alcohol abuse and underage drinking.